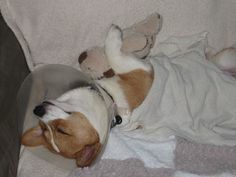 Here is what to expect after having your dog spayed or neutered. This is not intended to serve as medical advice as we are not veterinarians. ALWAYS follow the advice and recommendations of your veterinarian. If there is an emergency at any time, please contact your local emergency veterinary clinic. 1. Keep your pet quiet and indoors. No running, jumping, playing, swimming, or other strenuous activity for seven to 10 days. Inside they’ll be able to stay clean, dry, and warm. No baths during this recovery period.When dogs need to go outside, walk them on leash. 2. Check the incision site twice daily. Redness and swelling should be minimal and there should be no drainage. Do not allow your pet to lick or chew at the incision. Bitter Apple may be used around the incision to discourage licking or biting at the incision line; however, DO NOT put it directly on the incision. Use on the incision will sting and prevent the area from staying dry. 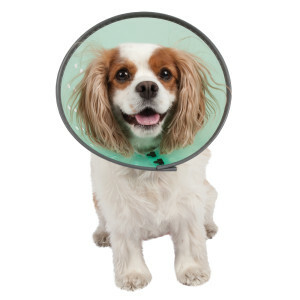 Purchase an E-collar from your vet or your local pet store if your pet will be left alone for any period of time. The edge of the collar needs to be long enough to go past the tip of your pet’s nose. It will prohibit him/her from licking, biting, or pulling at the incision. Usually, there are no sutures to be removed, unless otherwise specified by a clinic representative. 3. Monitor their appetite and response to food. Their appetite should return gradually within 24 hours of surgery. Start by offering a small amount of water after 6 p.m. If your pet keeps the water down, feed 1/3 to 1/2 their normal feeding after 7 p.m. If your pet vomits, then don’t feed again until tomorrow morning. Do not change your pet’s diet at this time and do not give junk food, table scraps, milk or any other people food during the recovery period. This could mask post-surgical complications. 4. Keep female pets away from male pets for 10 days after surgery. 6. Lethargy lasting for more than 24 hours, diarrhea, and/or vomiting is not normal. If any of these occur, your pet needs to be seen by a veterinarian. 1. Your female pet may have received a green tattoo at or near her incision. This is to show that she has been spayed and to prevent her from undergoing an unnecessary sterilization surgery in the future. 2. You will notice a reddish–brown stain on your animal around the surgical site. This is Betadine, a topical antiseptic used to sterilize the area prior to surgery. It will fade off the skin within a few days. 3. Do not be alarmed if your pet’s eyes look “weepy” or have mucous in them. Eye lubricant was applied to your pet’s eyes prior to surgery to prevent drying of his/her eyes. 4. Animals could have a mild cough after surgery due to the breathing tube placed during surgery. If the cough is persistent, or if nasal or eye discharge is present, your pet may have an upper respiratory infection (similar to the human cold). please follow up with your regular veterinarian for treatment. Your pet received pain medication(s) to help with pain control during the first 24 hours after surgery. If your pet needs additional pain medication, please contact your regular veterinarian.